The first post in this project gave details of the skills (many optional, all suitable for beginners) that you can use to make your very own beautiful embroidered sewing machine cover. 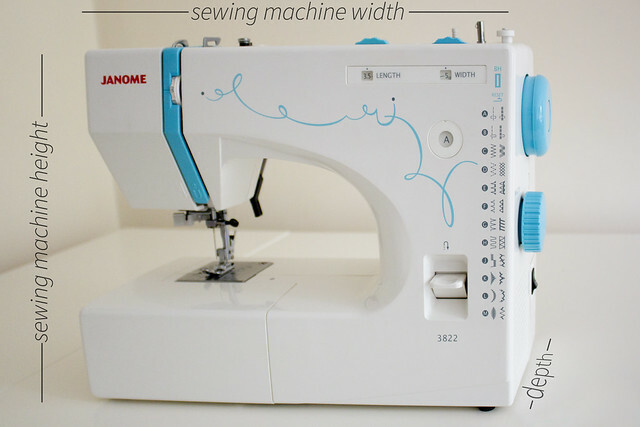 Making a sewing machine cover to fit your machine’s specific measurements is pretty simple as long as you take a few basic requirements into consideration. Your machine’s depth – the measurement from the frontmost to rearmost part of the machine – again, all protrusions such as the ‘reverse’ button or any dials or other buttons and levers should be included in the measurement to find the widest part. 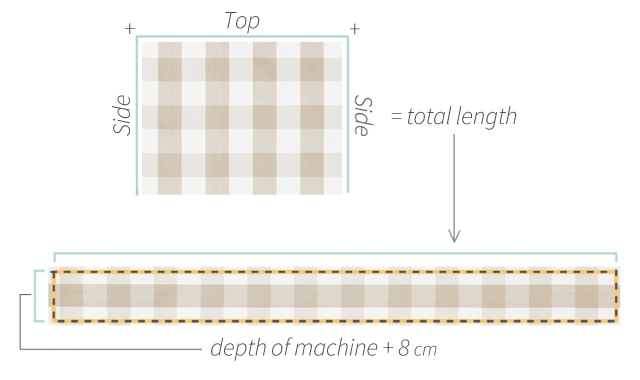 Once you have measured and re-measured the height, width and depth of your machine with all protrusions included and made a secure note of these measurements you will use them to calculate the sizes of three rectangles. The first two that form the front and back of the cover) will be the same size. 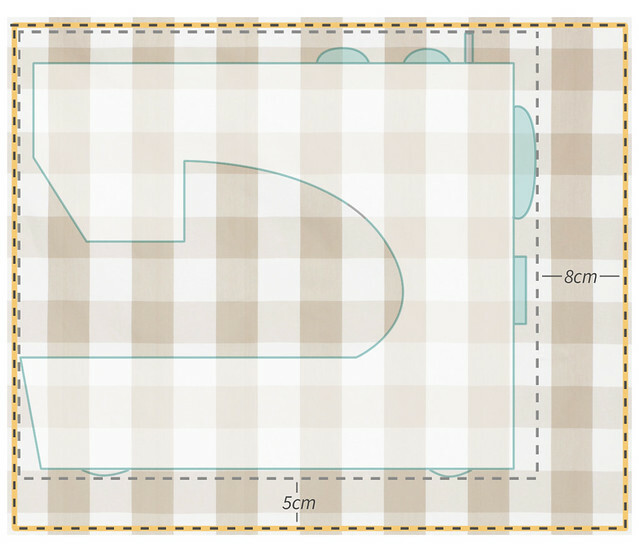 Take your measured sewing machine width and add 8cm. Take the measured sewing machine height and add 5cm. Mark and cut two rectangles according to these measurements. You’ll cut your final rectangle by first taking the measurements of one of the two main pieces you have just cut as shown below. Take the total measurement of both sides and the top of one of your cut pieces to give you the total length of the final piece. The measurement of the shorter side is given by simply taking the ‘depth’ measurement of your machine and adding 8cm. If you wish to give a padded, quilt-effect to your finished cover you will also need to cut your fusible fleece pieces. I only quilted the front of my machine cover for stability. To do this simply cut a piece of your fusible fleece to the same dimensions as the piece of fabric you have cut for the front of your machine and then trim 1.5cm off of all four edges (this will allow you to sew the seams without having to tackle any extra bulk). Do not apply your fusible fleece at this stage. To protect the fusible fleece you should also cut a piece of lining fabric exactly the same size as the main fabric for the front of your machine cover. These are all the simple shapes you need for your sewing machine cover. 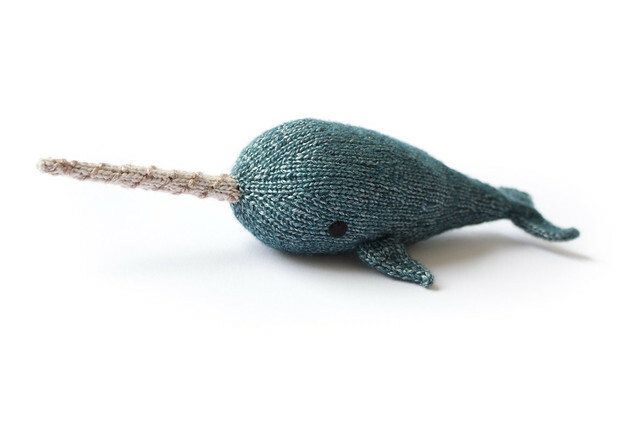 The next post will cover the embroidery pattern and simple stitches that even a very beginner such as myself can use to decorate the cover.